Photos by Emily Russell and Wesley Early. 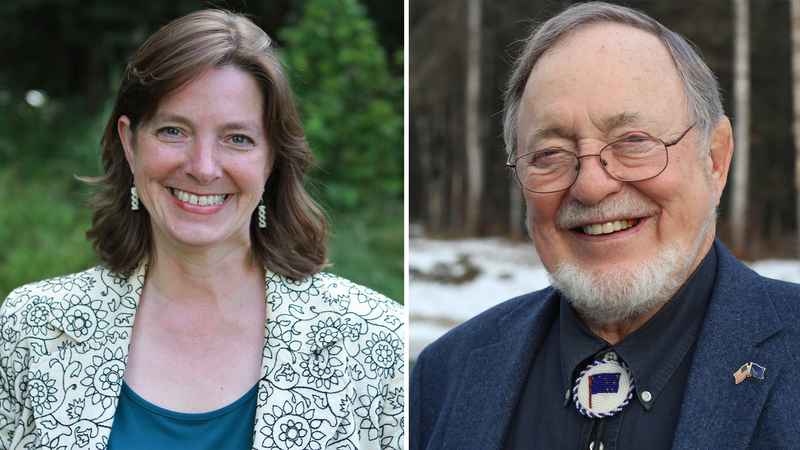 A new poll suggests Alaska Congressman Don Young may be in a tight race. Alaska Survey Research shows challenger Alyse Galvin is within four percentage points of Alaska’s lone U.S. House member. “Certainly Alyse Galvin has put herself in position where it’s possible that she may win,” pollster Ivan Moore said. Moore, though, pointed out that Young has been winning elections for 45 years. Moore’s survey, conducted in the first week of October, shows 49.7 percent of respondents said they’d vote for Young, if the election were held that day. Forty-six percent said they’d vote for Galvin – even though nearly that many said they didn’t know who she was. Moore said respondents who don’t like the Republican incumbent may have been giving Galvin the benefit of the doubt. A word of caution here: In 2008 a slew of polls, including Moore’s, showed Ethan Berkowitz was going to beat Young. He didn’t. Moore has a theory about that. The weighted sample was 500 likely voters, reached by cell and landline. The error rate was plus or minus 4.4 percent with 95 percent confidence. Moore conducted it as part of a series, funded by a group of clients that he said do not include candidates or political parties. A similar survey he conducted in late September showed Galvin was behind by 11 points. Galvin is an independent who won the Democratic Primary in August. Moore’s firm, Alaska Survey Research, also released poll results Monday for the race for governor. Republican Mike Dunleavy had a nearly 20-point lead over independent Gov. Bill Walker. Democrat Mark Begich was third.